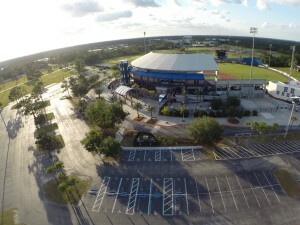 Tradition Field (Formerly Digital Domain Park & Thomas J. White Stadium) is a baseball stadium located in Port St. Lucie, Florida. The stadium was built in time for the 1988 season and holds 7,160 people. It is the Spring training home of the New York Mets, as well as the home to the St. Lucie Mets Class A team and the Gulf Coast Mets Rookie League team. The Stadium featured several new amenities in 2012. The rightfield bleacher was replaced with 500 field-level seats, highlighted by an outdoor bar and grill similar to the third base-side Tiki Bar. The rightfield section was also connected to he outfield grass berm area for easy access throughout the facility. The scoreboard was upgraded to include a larger screen and no replays highlights in HD.